I just got a 10" SB. Some previous owner replaced the motor with a 3/4 hp capacitor start. 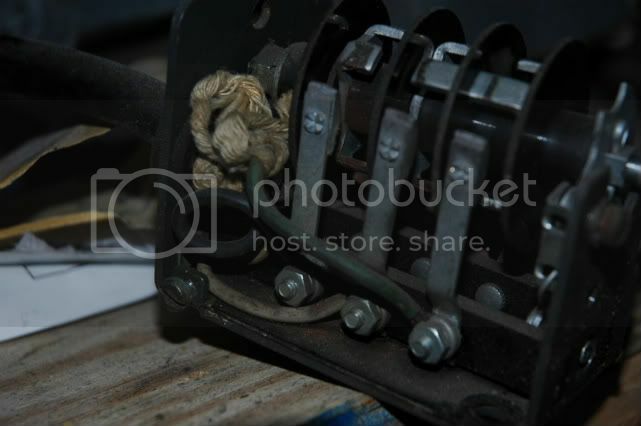 There is no info inside the original drum switch so they just wired in a light switch. Can anyone out there post a sketch of the SB drum switch schematic. If I can see that I can sort out the motor part. I was still confused so I took it to a friend who has a motor rewind shop. You have just identified the one single problem with those reversing drum switches. switch. Doubled-up SJ cord, taped up wiring, all kinds of whacky stuff. switch. 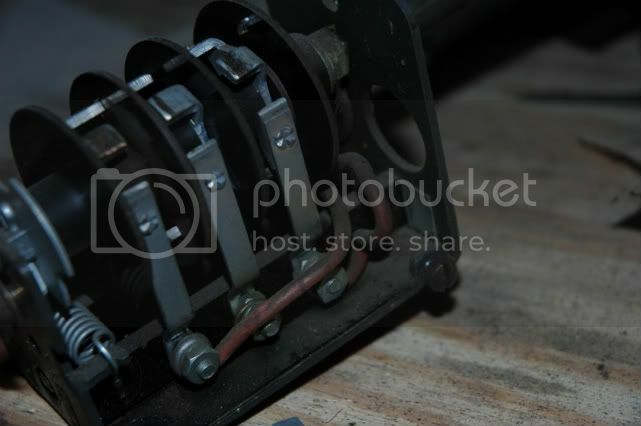 Often the drum switch gets a straight fitting, the motor gets a right angle. and stuff the diagram and a couple of copies in a safe place for the next owner. monkfe posted good pics, but I just wanted to add that most all drum switches seem to be very basic switches, 6 poles with 3 in and 3 out. I have an old one on my Nichols mill that is very similar, but different part than pic'd. I need to find an original for my 9A, it has a 3-way toggle switch that replaced the original, and I would rather have an original for it. Not all switches are the same. There is a different type out there. It was used on the 9/10K with "Instant Reversing" single phase motors. This is a true 3P DT swithh and has 9 screw terminals. On the Instant reversing motor either 7 or 8 terminals are used. I have one on my Heavy 10 and they are recognized by having 9 screw terminals with a row right down the middle. The diagram on the upper right describes this one. It was standard on some South Bends. Not all switches are the same. Yes, you need the schematic for the proper drum switch poles, but the drum switch just routes the power to the proper poles. They certainly are not 3 on each side, maybe that is what you thought I meant, and if so I didn't mean to. The drum switch I was working on recently was an old Allen-Bradley from the 40s, and it had the schematic inside. Most all drum switches are marked with corresponding Tx and Lx poles, as I recall, could be wrong on that. Mine seemed pretty straight forward when I wired it up recently. The words I was having trouble with are the "All Drum Switches" part. Yes most are very basic and similar. There are, however some out there that are very different. I posted a thumb-nail. This is as large a thumb-nail as allowed. This is a true 3PDT switch on my Heavy 10. It can be wired for any application, Single phase, three phase and "Instant Reversing." It can do anything the above pictured drum switch will do and it will handle the 'Instant Reversing" motors, which the above switch will not do. It has 9 terminals. The three center terminals will connect to either the poles, on the same level, on the left or the right. The center position of the lever is open to ALL terminals. I am not in general taking issue with any of your statements but since we have a lot of Newbee's who might have an application for this type of drum switch they should know its available. I myself was not aware of the difference until last summer when a friend got an Instant Reversing motor for his 9" and I agreed to wire it. I spent most of a week tracking down the right parts. Thats that one cutler hammer switch with the 9 connectors for the instant reversing motors. Took me and my brother 3 days to figure it out( well most of two and part of one) and we have wired many motors up. Had one heck of a blue streak coming out my workshop!!! Works great on my lathe, and probably better than some of the other drum switches i have( gotta love the instant reversing motor!). My '47 9A has the instant-reversing feature with a 6-terminal drum switch. It's actually a fairly complex and interesting design.